Three years ago, Double Eleven released a gorgeous platform game called Cloudbuilt, a game which incentives creative play with its unique level design. Now, main character Demi is back in a remaster called Super Cloudbuilt, a remaster that proves to be even better than the original release thanks to a variety of enhancements. As already mentioned, Super Cloudbuilt stars Demi, a young soldier who wakes up in the empty shell of a ruined building with no recollection of how she got there in the first place. By following a mysterious light, Demi finds her physical body, and by completing challenges, she finally remembers why she is in the state she is. 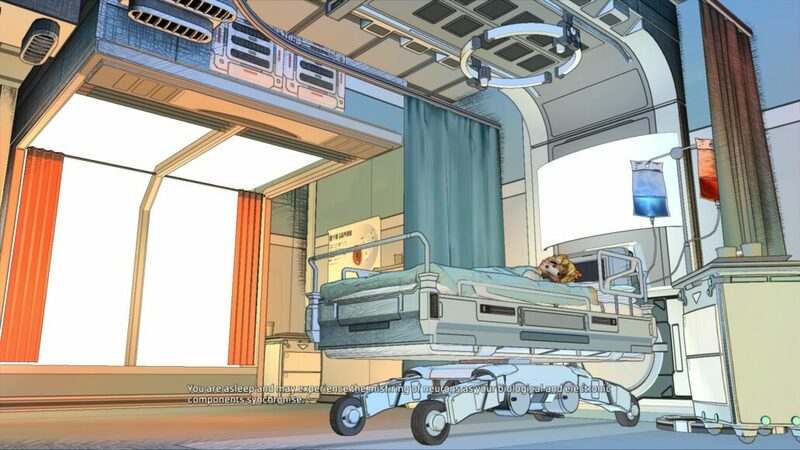 Surprisingly enough for a platform game, the Super Cloudbuilt story is very interesting, managing to convey the disorientation Demi feels through simple voiced lines and location design. The atmosphere, in particular, is excellent, with the tutorial area, the ruined building, evoking the same feel of mystery and desolation as Nier Automata. 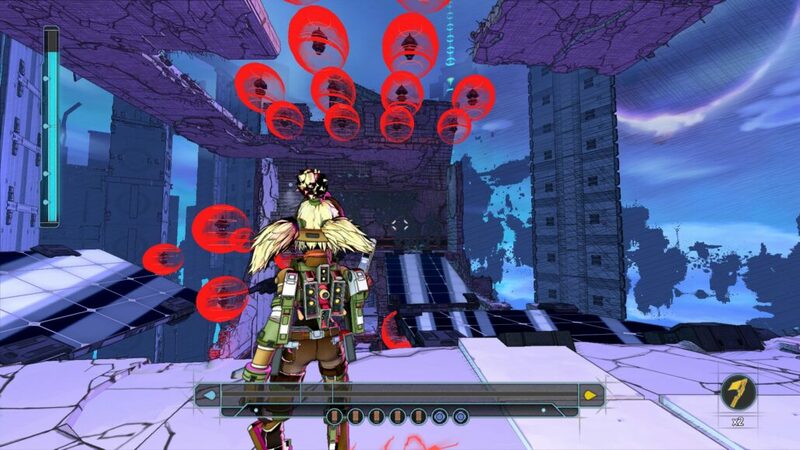 Additionally, the cel-shaded style graphics evoke a comic book-like feel, making Super Cloudbuilt one of the most unique looking and charming platform games around. Even with a strong and enjoyable story, a platform game requires solid mechanics, and Super Cloudbuilt also delivers on this front, offering an incredibly engaging experience that incorporates elements from a variety of other platform games. While exploring each of the game’s stages, Demi has the ability to use her rocket powered exo suit to dash, reach otherwise inaccessible areas and extend her parkour abilities. Controls are a bit unusual for a platform game so it may take some time to adjust to them and avoid losing lives in stupid ways, but before long, players will be able to take advantage of Demi’s abilities to the fullest. What makes Super Cloudbuilt such an engaging experience is the level design, which is excellent. For starters, there isn’t a set path to each stage’s goal, as players can reach it by following a variety of routes, in the vein of older Sonic the Hedgehog games, especially Sonic CD. This approach to level design incentives different play styles, depending on what the player is aiming for: those looking to get all collectibles will play the game more methodically, searching every nook and cranny, while those aiming to get a top spot on the leaderboards will play the game as a high-speed platformers, skipping exploration in favor of the fastest possible path to the goal. All this makes the game incredibly varied. Most of the stages also come with some interesting gimmicks, such as Total Dissipation Fields, which prevent energy recovery, that force players to adapt to the situation. Each stage also has plenty of enemies that will do everything in their power to kill Demi, but thankfully our heroine has the ability to fire types of different shots which are more effective depending on the situation, a feature that has been definitely inspired by the Mega Man series. And like platform games of years past, Super Cloudbuilt is a challenging game that will put players’ skills to the test; the addition of a limited number checkpoints that can be placed freely is a welcome one that makes the experience less frustrating. Super Cloudbuilt manages to keep players attention with a variety of content and play modes. Outside of the already mentioned collectibles, some of them unlocking enhancements for Demi’s performance, the game features a variety of outfits, which are unlocked by completing specific tasks, 177 challenges and two additional games modes: Ranked and Rush. Ranked mode keeps track of the fastest completion time for all stages, while Rush Mode tasks players with completing a set of stages under specific conditions. These two additional modes are perfect for those who wish to further master the game and its high-speed experience. As already mentioned, Super Cloudbuilt looks great, with a cel-shaded style that brings a comic-book like atmosphere. Those looking for a different visual experience can also choose different render modes such as Painted and Sketchbook which look as good as the standard one. The game also runs great on an i7-3770, 16 GB RAM, GTX 980Ti GPU powered machine, keeping steady 60 FPS even during the fastest sequences. The soundtrack is also very nice, reminiscent of early 90s platform games with a couple modern twists. At the end of the day, I have thoroughly enjoyed my time with Super Cloudbuilt, mostly thanks to the excellent level design that makes the experience feel fresh and exciting. With a huge amount of content and the additional play modes, Super Cloudbuilt has a lot that platform games fans will surely love. Super Cloudbuilt is a high speed, low gravity platform game featuring an excellent level design, a lot of additional content and some online modes that help make the experience never feel dull. Controls may take some time to get used, but after a few stages, players will be able to fly through stages in search of the fastest way to complete it and score a high place on the Leaderboards as if it were second nature. Highly recommended to platform game and especially Sonic the Hedgehog fans.